A unique assemblage including kumdykolite and kokchetavite, polymorphs of albite and K-feldspar, respectively, together with cristobalite, micas, and calcite has been identified in high-pressure granulites of the Orlica-Snieznik dome (Bohemian Massif) as the product of partial melt crystallization in preserved nanogranites. Previous reports of both kumdykolite and kokchetavite in natural rocks are mainly from samples that passed through the diamond stability field. However, because the maximum pressure recorded in these host rocks is <3 GPa, our observations indicate that high pressure is not required for the formation of kumdykolite and kokchetavite, and their presence is not therefore an indicator of ultrahigh-pressure conditions. Detailed microstructural and microchemical investigation of these inclusions indicates that such phases should instead be regarded as (1) a direct mineralogical criteria to identify former melt inclusions with preserved original compositions, including H2O and CO2 contents and (2) indicators of rapid cooling of the host rocks. 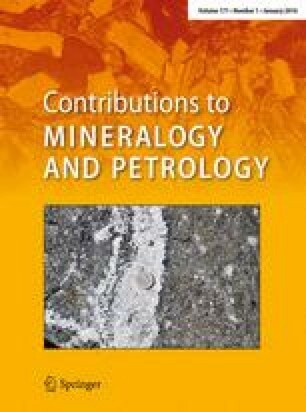 Thus, the present study provides novel criteria for the interpretation of melt inclusions in natural rocks and allows a more rigorous characterization of partial melts during deep subduction to mantle depth as well as their behavior on exhumation. The Alexander von Humboldt Foundation, the German Federal Ministry for Education and Research, and the Deutsche Forschungsgemeinschaft (Project FE 1527/2-1) are gratefully acknowledged by SF for funding this study. RJA was supported by a European Research Council starting Grant 307322 to F. Nestola. The authors are grateful to Katarzyna Walczak who provided the samples and to M. Steele-Macinnis, M. Konrad-Schmolke, and Eleanor Berryman for thought-provoking discussions on the behavior of the melt inclusion and daughter phases on cooling. Christina Günther and Peter Czaja are acknowledged for the help provided during the analytical sessions. Comments and suggestions from Othmar Müntener and two anonymous reviewers improved clarity and quality of the paper.